The Duval County Courthouse is one of 12 sites that Preservation Texas, Inc. has named to its tenth anniversary retrospective list of Texas’ Most Endangered Historic Places. 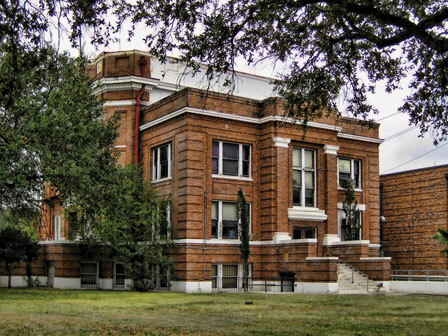 Originally named to the 2011 list of Texas’ Most Endangered Historic Places, the Duval County Courthouse is listed as threatened on the 2013 list. Preservation Texas officials announced the selections on the steps of the Texas State Capitol on Preservation Day, February 20. The annual announcement is part of Preservation Day activities organized by Preservation Texas. Advocates from all over the state come to participate in informational sessions, meet with legislators at the Capitol and get an in depth look at lessons to be learned from the sites named to the list. The Duval County Courthouse is an example of the many Texas courthouses that still need renovation. In 1998 and again in 2012, the National Trust for Historic Preservation named Texas’ courthouses to its list of America’s 11 Most Endangered Historic Places. The National Trust has since named them a National Treasure, signifying their national significance and the Trust’s ongoing commitment to their preservation. In February 2013 the “I Love Texas Courthouses” campaign traveled through Texas. Launched by the National Trust and Preservation Texas with support from the Texas Historical Commission, the campaign is increasing awareness of the importance of the courthouses to Texas’ history, culture and community. Since 1916, the Duval County Courthouse has served as the seat of government for Duval County. The courthouse was designed by Sanguinet, Staats, & Gottlieb, a successful and influential architecture firm in Texas. The Duval County Courthouse is falling apart despite its use for a majority of the county’s government functions. The building is threatened with structural damage, substantial water infiltration, and malfunctioning plumbing, mechanical and electrical systems. The courthouse is overcrowded with county officials, staff, and prison functions, which has resulted in the use of electrical equipment rooms as staff offices. The historic resources in Duval County represented by the courthouse are matched only by the area’s natural resources that have generated tremendous growth in the South Texas economy with the resurgence of oil exploration. With increased political and community leadership, the county should be able to use these natural resources to save the courthouse.